Like mothers and fathers and teachers, authors should not have favourites. I can’t help it: Koala Lou is my favourite, probably because it’s about sibling rivalry and not winning an important competition, which means it’s actually all about me! 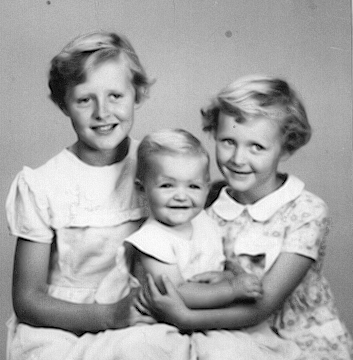 I’m the oldest of three girls: that’s me in the photo in 1956, aged ten, with my sisters, Alison, whom we call Lailu, and Jan. I had ruled the roost for four years in our family until Jan arrived and shook me off my perch. I wondered from that moment onwards whether my mum and dad loved me as much as they had before Jan was born. And then Lailu arrived, as well! Good grief! On top of these anxieties I suffered a severe blow when Possum Magic did not win the annual Children’s Book Council Book of the Year Awards in 1984—it came second. Both these themes are explored in the book. But that’s not how it began. It was Olivia Newton-John who started it all. As well as being a singer and film-star she’d opened up Koala Blue, a store in Los Angeles, in which she was selling Australiana as well her line of clothing. Possum Magic was on sale in her store. (She called her daughter Chloë and I often wonder if the dedication in Possum Magic had any influence on that decision.) She wrote and asked if I would write a book about a koala named Blue, which she would market and sell through her shop, along with a toy koala of the same name. I told her, as I tell everyone, that I can’t write to order—the story has to come from my own life, but I would think about it. That was 1983. In 1984 Los Angeles was to host the Olympics. I thought about the young competitors from Eastern Bloc countries in particular, who had trained for four years to win gold, not silver. What happened I wondered, if they did come second? Did they go home and sob in their mothers’ arms? I began to write a story about a male main character named Koala Blue. When it was finished and Olivia had looked into publishing it, she realized that only publishers can publish books—it’s too difficult and complex for anyone to tackle alone. So she gave me back my story and asked me to change the name—Koala Blue was her copyright. 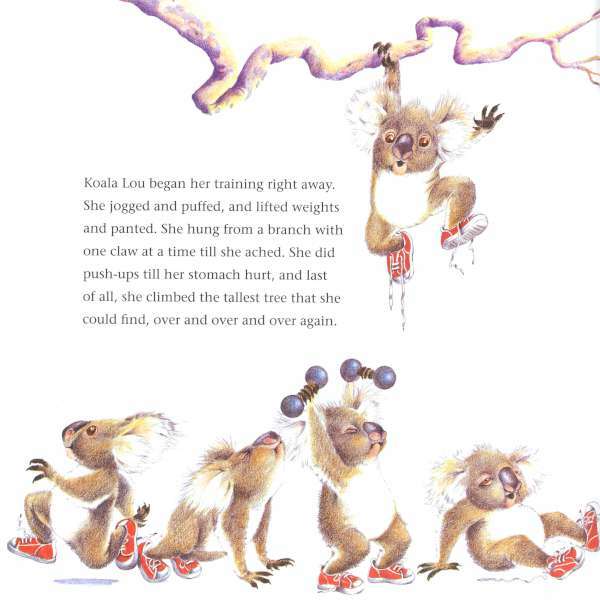 Koala Lou was made into a delicious musical for little kids, which premiered in Adelaide in October 1997 and I wept buckets every time I saw it. (No one seems to know what’s happened to it since then.) Negotiations were also under way for a feature film at one point, but came to nothing. I did go to Hollywood, however, which was mindboggling. 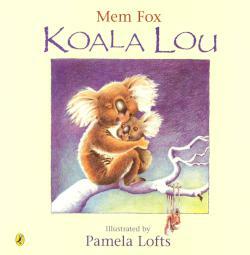 Koala Lou, being about sibling rivalry, HAD to be dedicated to my two much-loved and long-suffering sisters. It’s a book for the oldest child in every family!